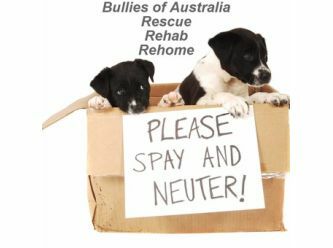 Bullies of Australia Rescue, Rehab, Rehome or BARRR is a family owned rescue dedicated to helping bullies in need all over Australia. We are NOT a no-kill rescue, we do not take on or rehome human aggressive dogs. Our mission is to be of help to both Human and K9 by creating a safer community, safer dogs through education, training and ethic rehoming. & the Dog Psychology Center Australia. All dogs at BARRR have been through a training program and are temperament tested by a qualified vet before leave our centre. Our dogs like every ethical rescue come vaccinated, microchipped and desexed all included in the adoption fee. Book in a meet and greet at bullierehab@gmail.com ( please note we operate by appointment only and time is very important! The time agreed upon can not be changed and MUST be respected, BARRR is ALWAYS working and will need to make time for your arrival. If you are running late you MUST inform BARRR so we can arrange a new time. (you may have to wait for a new time slot opening if you are late) CBE DPC encourages you to leave your home early and take into consideration traffic conditions.